This is our first newsletter. How does the process work? What do I have to provide for each newsletter? Newsletter writing is not my strength. How do I know the newsletter articles will be well-written? Do you require a long-term commitment? Will my newsletter design complement our existing marketing materials? How can I be sure my newsletter will go out as scheduled? Does your newsletter service include printing and mailing the newsletters? Can I put the newsletter on my website? Having produced hundreds of newsletters over the past decade, we’ve learned to streamline the newsletter publishing process. We’ll guide you each step of the way to minimize your time involvement while producing a superior newsletter. Here are the steps involved in publishing a typical newsletter for the first time. The first step in the process is to discover your goals and objectives for the newsletter, including your target audience. We’ll then choose a name for the publication and design the nameplate (front-page header), maintaining continuity with your corporate identity. The next step is to determine regular features (such as columns) and create a list of articles/content for the first issue. This includes content you provide us, as well as stories we are to write. For the stories we are to write, we’ll request the name and phone number of the appropriate contact person (whom we would call, interview and possibly quote in the article). A timeline will also be created. Once we have the content/articles list (including images), we’ll write the articles and lay out the first draft, adding any necessary illustrations, photos or graphics to enhance the newsletter’s design. The first draft will be e-mailed to you in PDF format. You will be asked to review the articles, as well as the newsletter’s design and layout. Edits/changes to articles will be made. In addition, if you are not content with the design and layout, we’ll make revisions until you are completely satisfied. After a round or two of drafts, you will be asked to approve a final draft. This approved draft will be carefully reviewed by a professional proofing service to ensure it is mistake-free. Once the newsletter has been professionally proofed, we then manage the entire printing process. The printed newsletters will either be mailed directly to your readers or shipped to you. Our goal is to minimize your involvement so you can focus on your “real” job. You simply send us the copy (articles or raw information) and photos for each newsletter and we do the rest. Materials are usually sent electronically and we provide guidelines for word counts. It couldn’t be simpler. Because it’s our job to be The Newsletter Experts. Your copy will be professionally edited for grammar, spelling and clarity before being returned for approval. We’ll make sure “you” write exceptionally well. We establish a fixed project cost for your company newsletter. This means no surprises and allows you to budget the same cost for each issue. No. We don’t require you to sign a contract. We believe we earn your business by proving ourselves with each issue. Clients have used our newsletter service for years because of the value we provide – not because they are locked into a contract. Will the newsletter design complement our existing company’s look and feel? Yes. 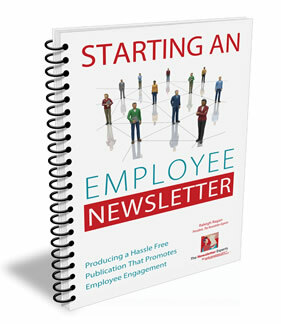 We highly recommend your employee newsletter maintain continuity with your company’s identity. We review your company’s “brand” and design your newsletter so that it fits into the overall look and feel. To keep your newsletter on track, we provide a project schedule complete with deadlines. When necessary, we gently prod clients with reminders to ensure the newsletter production stays on schedule. Absolutely. While you can certainly choose to handle printing and mailing yourself, almost all clients outsource these aspects as well. Our vast production and relationships with numerous printers means we can usually have your newsletter printed and mailed for less than you could do it yourself – often dramatically less. In addition, our mail houses will save you quite a bit of money on postage. Sure. We provide web-quality PDF files at no additional cost.